Professor Madhu Bhaskaran co-leads the Functional Materials and Microsystems Research Group at RMIT University. She is also the Associate Dean for Higher Degrees by Research at the School of Engineering. She has won several awards and fellowships for her research including competitive Australian Research Council Postdoctoral Fellowship (2010-2014) and Australian Research Council DECRA Fellowship (2016-2018). She has also won a Victoria Fellowship and has been named as one of Top 10 Innovators under 35 for Asia (MIT Technology Review 2016). 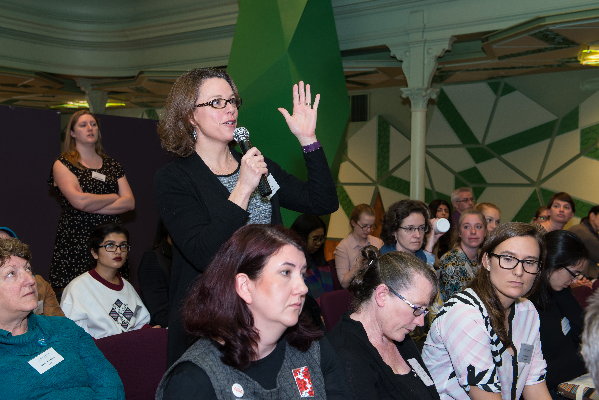 A staunch advocate for women in science, Madhu is a co-founder of the Women Researchers’ Network at RMIT University and has served on the Board of Directors with Women in STEMM Australia since 2015. Her research interests include functional oxide thin films, wearable technologies and stretchable electronics. In 2017 she was recognised with the Eureka Prize for Outstanding Early Career Researcher and also named as one of Australia’s Most Innovative Engineers by Engineers Australia. She recently won the Australian Academy of Technology and Engineering’s Batterham Medal, the APEC Science Prize for Innovation, Research and Education, and the Victorian QuickFire Challenge: Driving Device Innovation. It would have to be my time management skills. They have certainly helped me prioritise opportunities and also make the most of them. And also knowing how to turn a meeting into an email and also hold effective meetings. In the earlier stages of your career, say yes to many things – this is the best way to get to know people from different sectors and also truly understand what are the opportunities you can say no to in the future. What are you most proud of in your STEMM career? What gives me happiness is that I have managed to do many things beyond research in my career so far – this includes mentoring PhD students and postdocs, holding leadership positions in the Higher Degrees by Research space (and that has helped enhance the research environment at my workplace) as well as contributing to the gender diversity space through my roles in Women Researchers’ Network at RMIT, and nationally through Women in STEMM Australia. I still have this (and have had imposter syndrome for a very long time without quite realizing that is what it is called). I was at a recent panel event where we realized women tend to say “I was lucky to win…” much more often. We put down more things to luck besides hard work and actually being deserving of recognition. When I am riddled with imposter syndrome, taking a look at my CV and convincing myself that “I deserve to be here and not everything can due to only luck” helps! What have you learnt during your career to increase your resilience? I always believe in having Plans B, C, and D to overcome failure. We deal with rejection and harsh comments on papers and grants so often and if the success rate is 20%, I make sure I have 5 things going at the same time so that at least one gets through!! Understanding that there are many factors which lead to rejections of papers and grants (and one of the reasons includes politics) certainly helps increase resilience.